been reading “The Clockwork Orange” by Anthony Burgess. English mixed with some anglicized Russian word as well as some cockney rhyming slang. many times a person can switch from slang to “normal” in an instant. In many ways slang is poetry, which is very evident in rap music. book. Which bring me to the prompt. if you feel like it, you can even try to write a poem in Nadsat if you want. Make sure that you write it in such a way that it could be understood by the context of the poem. Here is a link to Nadsat vocabulary and here is one to Cockney rhyming slang. Welcome to Artistic Interpretations. I am fortunate to share poetry with local poets once a month here in the Blue Ridge Parkway area of North Carolina. Sitting in a room surrounded with displayed art, it is truly a creative environment. Each month the venue has new local talent displayed and often the art work is for sale. I fell in love with these alcohol inks and I hope you find inspiration in them as well. Many were for sale for very reasonable prices (most within a $15 - $40 range) If you have a particular interest, please let me know and I can reach out and find out if it is still for sale. Please interpret the image in any way you please, but I have listed the artist's title below each image. I asked if I could photograph these images and I was given a thumbs up. I have twelve more to share with you for the next Artistic Interpretation's challenge. You may select as many images as you wish to write to, but please have each poem be original. Link your specific post below to Mr. Linky and then visit the other poets as we all love to know we have been enjoyed and read! I look forward to your Artistic Interpretations! Welcome to The Last Tuesday Platform of 2018. Another year draws to a close. And what a year it has been - for many, filled with triumphs and tragedies. And so we may pause, in our moments of celebrations, between the hoopla and the hustle and rush, and consider - reflect on what we've accomplished and achieved, perhaps even, set new goals. However you celebrate and wherever you are, I do wish you Peace and Light for the endings an old year brings, and Hope as the new begins. standing in the museum before Rembrandt's "Juno,"
days we would rather know that never come. And so Toads, travelers and friends, here is the moment - to share one last poem on the platform for 2018. Choose your poem. Link up. Come back to catch your breath and rest up - reading and sharing your comments, once again, before the days change over to a new leaf - clean sheets (pages) and we walk into 2019. 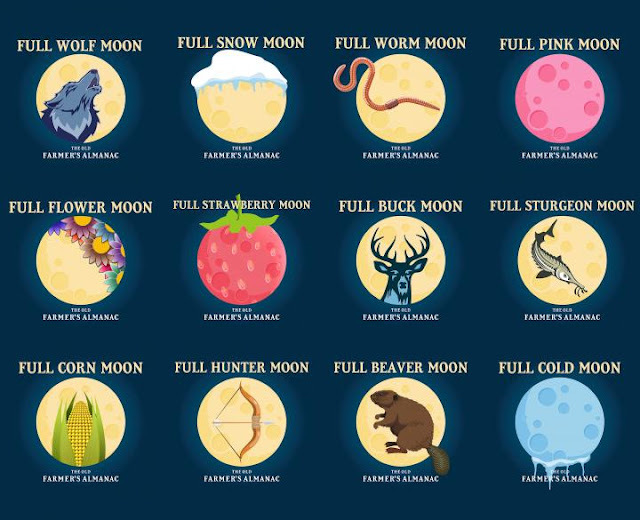 I would like you to write in any form except prose (unless you do a haibun) a poem about the full moon. Choose one of the names and write about it - if you use the Native American name put that name in your poem and/or title. I would also like you to make this a spare poem - less than 100 words. Please, no more than 100 words. This is an example I recently wrote and posted on the Wolf Moon. It is 50 words. like a sky mounted mirror. sniffing the smell of the wind. So get out there. Howl at the moon, take a walk by moonlight, or do as I do sometimes on sparsely populated country roads and take a drive with your headlights off. 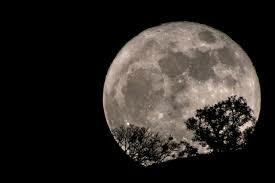 Write a poem about the full moon. And visit and read the other poets too. Learn about the different full moons. Celebrate the winter solstice. And above all - write!!! Hello Toads and pond followers. Fireblossom here with another Fireblossom Friday for you. Does it ever seem to you that there is something....something that should be there, but isn't? Or, has there ever been a thing so common that it seemed it could never be gone, but now it is? I can think of one--the thylacine. 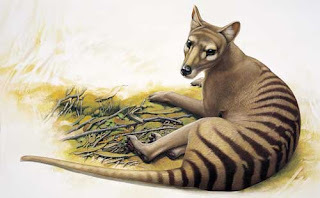 The thylacine was a carnivorous marsupial--let *that* sink in--which lived in Australia, Tasmania, and New Guinea from time immemorial until the early 20th century. 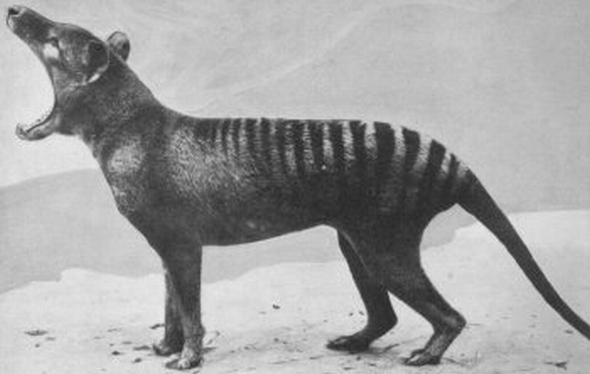 Also known as the Tassie Tiger or Tasmanian Wolf, it had striped hindquarters and its mouth could open to the widest gape of any land animal. Because it predated on chickens and livestock, a bounty was placed on its head, and it was hunted to extinction. The last known thylacine died in the Hobart Zoo in 1936. 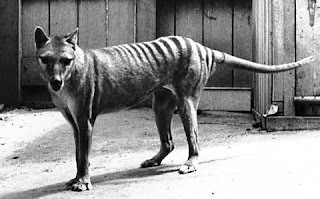 And yet, the thylacine still holds a fascination for many of us today. Sightings occur rather often, and though none have been proven authentic, it is tantalizing to think that this odd and remarkable animal might still survive. In a larger sense, the thylacine is emblematic of human short-sightedness and the loss of something irreplacable. For our writing, there are several possibilities. You could write about the actual creature, either from your own or the animal's (imagined) point of view. You could write about the thylacine metaphorically, as a symbol for anything gone, wasted, missed, or surviving despite all odds against it. 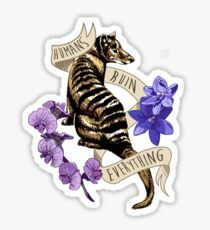 Finally, you could celebrate the thylacine for its utter uniqueness--there is no other like it. Take this and run with it, poets, but I prefer that you not go the jokey route, ok? Let's show this fascinating animal some respect, at long last. Poems of any length or style are fine, as is flash fiction or flash 55 (exactly 55 words.) Then link, visit, etc. 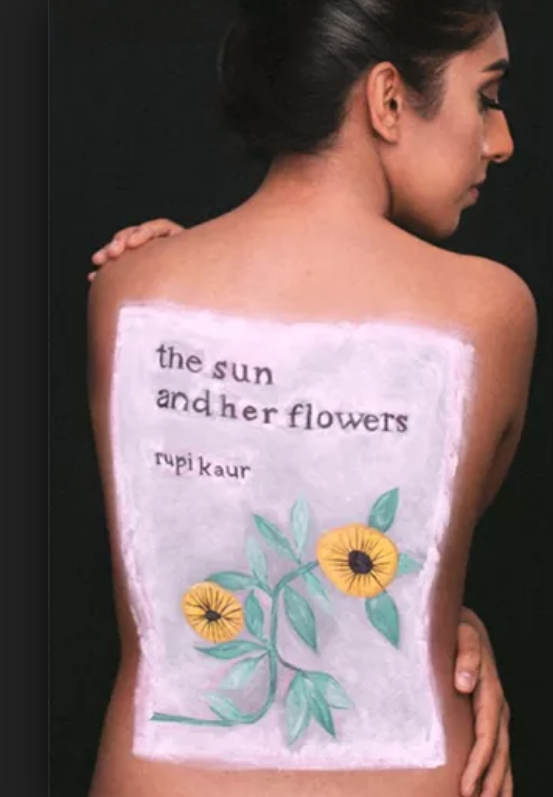 I've only just come across some amazing poetry written by Rupi Kaur. I love her style; simple yet rich. Take a look at these two pieces and see what you think. Greetings to all poets and friends and visitors….from a very chilly London! Winter is here and Christmas is coming..so Season's Greetings to one and all. That said, I'd much rather sit by the fireplace reading poetry..and today, it's your poetry! Feel free to drop a line, a verse, a sonnet....anything you want to share with the universe and us, too and please, don’t forget to read/comment on the works of your fellow poets. Greetings, dear Toads. I am beyond happy to be back from my hosting hiatus. I missed creating prompts for our Garden. In fact, I thought about it quite often. 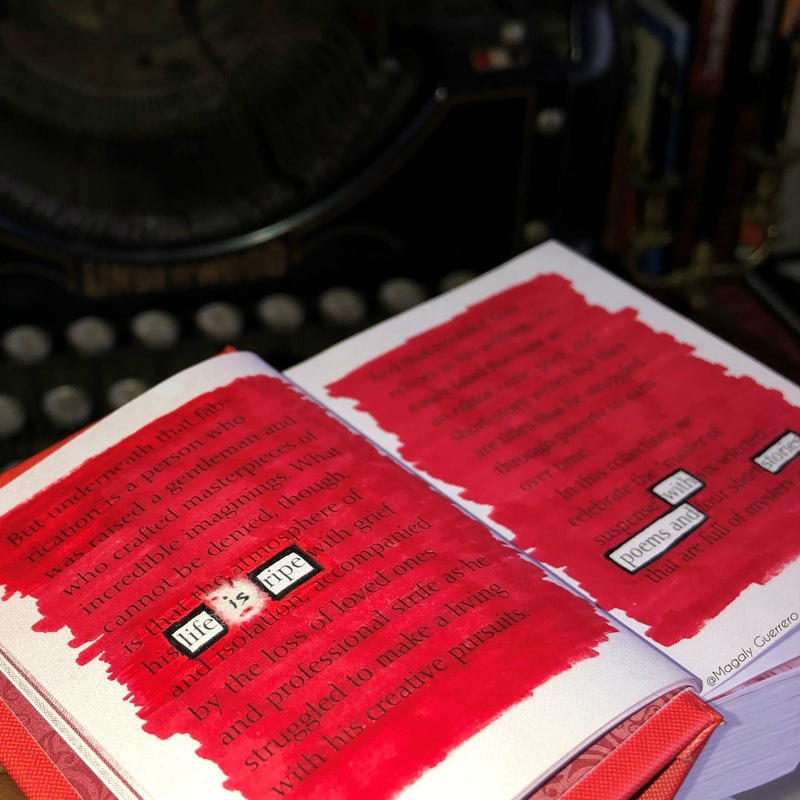 So, when one of my nurses gave me a miniature copy of the Selected Works of Poe, which I already own, I could not resist using one of the wee books as a source for blackout poem prompts. The title for today’s prompt was inspired by the first poem bit I crafted out of the mini-book. the Prompt: Write a new poem centered around a childhood memory, which brings you joy as an adult. optional pump for your Prompt: Your poem, your form choice. However, the selfish reader in me would love to delight in some well-loved Prose Poetry (in 131 words or fewer) *wink-wink*. Please, add the direct link to your poem to Mr. Linky. Visit other Toads. Have a blast.